This is the best advice. Corporate uniform is more than capable of accomplishing all missions with minimal cost to our Members. 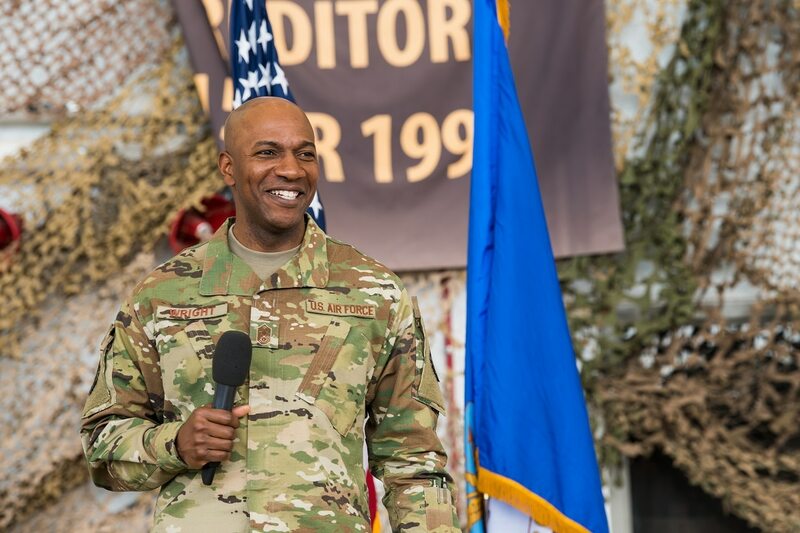 Chief Master Sergeant of the Air Force Kaleth Wright said in a Facebook post Tuesday. wearing OCPs during a trip to Cannon Air Force Base in New Mexico." Simply for ease of identification of friend vs foe in a combat/field/response environment, all US personnel and their Auxiliary Forces (CAP, USCGAux, SDFs, etc.) should be in the same working uniform, which was directed by Congress and by law several years ago. So we'll be switching to OCPs? Personally I think it's a great idea, although I think we should finish our phase-in to ABUs then switch. Also do you think this would mean that we won't be required to turn in our ABUs once we leave CAP? No congress directed no more service individual field uniforms. And by regs cap has to be distinct. There is zero reason for CAP, USCGAux, SDF, etc. to wear the same uniform and it is best that they are distinctive from the military as to not cause any misconceptions or issues. The Coast Guard Auxiliary already wears the same utility uniform as active duty and reserve component personnel. Other than the branch tape (USCG AUXILIARY vs US COAST GUARD), the color of the embroidery on the ball cap (silver vs gold) and the little "A" device on the insignia, the uniform is virtually identical. I've said that numerous times before. The USCGAux uniform and Coast Guard uniform are nearly identical. The same for the USNSCC (Sea Cadets) and Navy. They just wear a different name tape and patch, but the color combinations are the same. I don't get where the distinction got to be this great between CAP and USAF. I mean, it is what it is. But it peaks my curiosity. The Navy and Coast Guard appreciate these organizations. The USAF is much more image conscious. Frankly, I think their attitude misses the point that there is a substantial group of civilians that actively wantst to support them, but they are more concerned about appearance than anything else. How fortunate for them that the Post Office (whose uniforms served a the basis for the original USAF uniforms, no kidding!) did not object to that back in 1947-1948: :Hey, these wild fighter pilots dressing like us are ruining our reputation for somber reliability!" What I don't understand is the members of our organization who want to abandon USAF style uniforms for senior members. Why would you want to distance us further from our parent service? I get having corporates for people who can't, for one reason or another, wear USAF style uniforms and still wish to serve, but to abandon them entirely seems that it would only serve to increase the rift between CAP and USAF. If I had my druthers, ALL members able to wear USAF style uniforms would wear them and maintain military grooming and discipline standards. Don't want to act like a professional volunteer in an official auxiliary of a military branch? Fine, go join another organization. There are plenty of service organizations that will allow one to be bearded, long haired, not wear a uniform or salute, etc. If you want to serve in ours, to execute the missions that are particular to CAP, then you play by the USAF's rules. You either care enough about the mission to abide by the rules or you don't. Of course, I'm also the one who is instituting MANDATORY weigh-ins at my squadron (with the CC's blessing and support IAW the Wing King's stated intent) and calling people out for improper grooming while wearing the AF style uniforms. Individual feelings are less important than the overall image of CAP and the USAF team as a whole. Very Well said! I couldn't agree more!!! Because terminology is important, note that the USAF is not our parent service, no more than the Army Air Corps was when CAP was assigned to them. CAP's actual parent is the Office of Civilian Defense, which of course no longer exists. The USAF is most certainly a partner and a very important one, even if it's not a partnership of their choosing. As for distancing ourselves from the USAF, I don't see how an independent non-profit corporation choosing an unique uniform that the entire membership can wear distances ourselves from the USAF or any other valuable partner that we have. In fact it would probably help our relationship with the USAF, as they seem extremely concerned with our wearing a variation of their uniform. Think of it as one less point of contention between us and a very important partner. It also helps eliminate the two-class culture that we have that is clearly hurting the feelings of some of our members. I mean, look at the big picture, should we be pleased as a volunteer organization that we are weighing members solely to allow them to wear certain uniforms? Anyone with experience in CAP knows this is the only real answer, even if they don't like it. Think of it as one less point of contention between us and a very important partner. A point of contention that mostly exists on CAPTalk rather than out in the real world. While professionalism and appearance are important; I don't know if taking a scale to meetings is the best way to encourage volunteers to join CAP. Its hard enough to get people involved and keep them engaged with the program without the added stresser of making height and weight requirements. While at the topic every branch of the armed forces is realigning their pt standards to better reflect the missions at hand. Does this mean that CAP needs to institute a physical test for seniors to be able to ruck march 10 miles in order to wear the ES badge? Should we have a PT test for senior members in general added to the program? Where, when and how should CAP try to mirror the Air Force and where should we draw the lines that we are maintaining ourselves as a volunteer organization? Yes, there are some who should only be in the corporate uniform due to weight. However even the air force recognizes that some body types are larger than others and has a fallback system (tape test) to compensate for those who are slightly over the table weight. If we as an organization want to align more to a professional fitness standard then we need to have a similar tape or other catchall standard in addition to the table weights. If not then the final say on wear of the uniform should fall to the unit commanders discretion on whether the individual maintains a professional appearance or not. The motivation of wearing a uniform is a key factor, but height and weight are not the be all end all to physical appearance or ability either. You need to do your homework. There is no tape test in the AF. There is your waist, situps, pushups and a run. If you fail the waist then its a BMI index and that is a very narrow margin to pass. The AF does not have H/W standards outside of initial entry there is the PT standard based on age. We have H/W and it's only been recently that there has been any real action on enforcement. And yes for CAP if I as a commander want my people to weigh in every meeting to ensure compliance then they will weigh in or not wear AF style uniforms. If you sensitive about your weight then you do the right thing and wear corp uniforms. While there are medical issues than can impact weight there are just some folks who don't care about appearance and will do what they want to do and who cares about the rules. Bottom line compliance with CAPR39-1 is MANDATORY not when you feel like it. If you can't be trusted to follow the simple rules of uniform wear then you can't be trusted with bigger things. Incidentally according to AIR FORCE INSTRUCTION 36-2905, yes there is. Check section 3.6.5 before telling me there is no tape test (also known as a BMI check). Second, you as a commander have full authority to do weight checks as you see fit. CAP 39-1 is written in black and white, yes it is, however voicing some measure of disagreement in its enforcement is my prerogative as a free individual and I remain steadfast in my previous statement. I think CAP needs to either have a tape test (also known as a BMI check) of its own or the discretion should be left to the unit commander. You, as a unit commander should be able to choose whether to live on nothing but the regulation or to use better judgement in the case of minor deviations.